Thinly slice the green onions, chop the cilantro, and seed and chop the jalapenos. Cover potatoes with water in 4-quart saucepot. Bring to a boil over medium-high heat. Add 1 tablespoon salt. Reduce heat to low and simmer 10 minutes or until potatoes are tender; drain and cool slightly. Slice into 1/4-inch-thick slices. Combine mayonnaise, vinegar, jalapeno peppers, salt and black pepper in large bowl. Stir in remaining ingredients and toss gently. Season, if desired, with additional salt and pepper. Serve chilled or at room temperature. Note: based on a Bobby Flay recipe. A heavenly and healthy dish to warm you up on those cold fall and winter days. An easy all in one dinner. Egg, bacon and potato frittata in single serving muffin. Great to freeze and reheat for a quick on the go meal. Roasted veggies are wonderful for dinner. 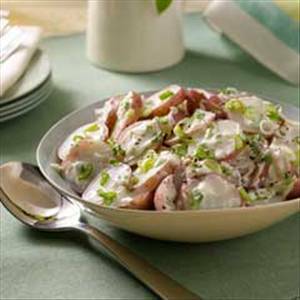 There are 306 calories in 1 serving of Green Onion Potato Salad. Calorie break-down: 48% fat, 47% carbs, 5% protein.